In transparent orthographic systems, the main characteristic of developmental dyslexia is poor reading fluency. 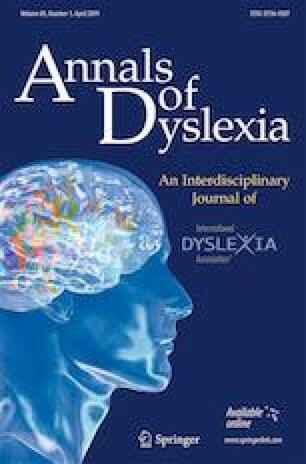 Several studies have reported that children with dyslexia have difficulties forming orthographic representations of words, which hampers good reading fluency. This study aimed at evaluating whether the semantic–phonological training prior to word reading could facilitate the formation of orthographic representations and leading an improvement in reading fluency. Twenty-four native Spanish-speaking children with developmental dyslexia carried out two different reading tasks. In one of them, participants previously received semantic and phonological information about stimuli whereas in the other task no previous information was provided. Eight different unfamiliar words (four short and four long) were used in each reading task and the reduction of the length effect across reading blocks was taken as a formation index of new orthographic representations. Results showed low accuracy, slow speed reading, and difficulties in developing orthographic representations despite of repeated reading, probably due to the instability in decoding processes. However, the previous phonological and semantic training had a facilitator effect in the formation of orthographic representations, as indicated by the decrease in the length effect. This study was funded by Grant PSI2015-64174-P from the Ministry of Economy and Competitiveness, Spanish Government. Kuznetsova, A., Brockhoff, P. B., & Christensen, H. B. (2017). lmerTest package: Tests in linear mixed effects models. Journal of Statistical Software, 82(13). https://doi.org/10.18637/jss.v082.i13. Kyte, C. S., & Johnson, C. J. (2005). The role of phonological recoding in orthographic learning. Journal of Experimental Child Psychology, 93, 166–185. https://doi.org/10.1016/j.jecp.2005.09.003. Lenth, R. (2016). Least-squares means: The R package lsmeans. Journal of Statistical Software, 69(1). https://doi.org/10.18637/jss.v069.i01.